Brinelle D'souza, who is with the Centre for Health and Mental Health, School of Social Work, Tata Institute of Social Sciences, Mumbai, has prepared a strong statement to protest the brutal murder of 13-year-old Rajalakshmi. "Other than a few media reports, this gruesome killing has not caught national attention despite a very vibrant #MeToo campaign currently underway", regrets D'souza. D'souza has sought a broad endorsement across civil society networks for the statement before sending it to the Government of Tamil Nadu, the Union Government, the National Human Rights Commission, the National Commission for Women, the National Commission for Schedule Castes, and and National Commission for Protection of Child Rights. We, the undersigned feminist groups and individuals strongly condemn the sexual harassment and brutal murder of 13-year old Rajalakshmi who was beheaded on October 22 by her neighbour Dinesh Kumar, an older man belonging to an upper caste. The dastardly act took place in a village on the outskirts of Salem, near Aathur, 14 kilometres away from Thalavaipatti. Rajalakshmi was studying in Class 8 in a nearby government school. She had reportedly told her mother about Dinesh’s continuous sexual advances, which she repeatedly turned down. That fateful night, she and her mother, Chinnaponnu, were alone at home when the crime took place. Her father, a daily wage labourer works in a graveyard because of which he often stayed away from home at night. 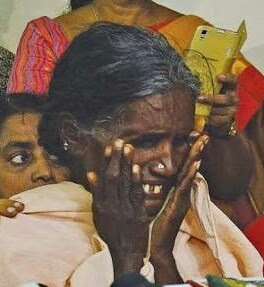 According to A Kathir, executive director of Evidence, a movement that works on human rights, among Dalits, Rajalakshmi and her mother Chinnaponnu were stringing flowers together when Dinesh Kumar arrived with a sickle. He abused them by targeting their caste, and beheaded Rajalakshmi, in spite of Chinnaponnu’s intervention. Thereafter, he took Rajalakshmi’s head and went home, where his wife Sarada advised him to discard it elsewhere. Subsequently, they went to the police station together where Sarada claimed that her husband was mentally ill. However, the police have dismissed claims that Dinesh was suffering from mental health problems when he slaughtered the minor and maintain that he is physically and mentally sound. Rajalakshmi was beheaded for speaking about her #MeToo incident. She was killed because she had the audacity to reject the sexual advances of an upper caste man and for speaking out. It is deeply shocking that a heinous crime such as this has evoked so little media attention even while the #MeToo Movement in India has captured the nation’s imagination and is garnering so much support. Given this context, the stoic silence from a large section of civil society, political class, child rights organizations, local and national media to the gruesome killing of a minor dalit girl is extremely disturbing. It is tragic that the sexual harassment faced by the minor and her brutal beheading by an upper caste man has not shaken the conscience of the country. Rajalakshmi’s killing brings to the fore the heightened vulnerability that Dalit girls and women face on a routine basis. Vulnerably positioned at the bottom of caste, class and gender hierarchies, Dalit women and girls continue to experience endemic gender-and-caste discrimination and violence including sexual violence as the outcome of severely imbalanced social, economic and political power equations. Their socio-economic vulnerability and lack of political voice, combined with the dominant risk factors of being Dalit and female, increase their exposure to potentially violent situations. Moreover, attempts by Dalit women/girls to protest or resist sexual harassment and assault by upper caste men have often led to brutal outcomes as witnessed in Rajalakshmi’s case. We join hands with human rights organizations, women’s organizations, the Dalit movement, Dalit women’s movement, child rights organization and concerned citizens in condemning the brutal murder of 13-year-old Rajalakshmi and the silence surrounding it. We call upon the government and the media to address, and not reinforce, the casteism and sexism in the society which operate to create a climate of impunity for perpetrators of sexual and physical violence against the most vulnerable women and girls, i.e. Dalits. The Government of Tamil Nadu provides the victim’s family protection in the wake of caste tensions and hostilities that may arise as a fall out of the brutal murder. Without proper protection, the family may flee the village in the face of threats and harassment from the accused and others in the village as is often the case. The Government of Tamil Nadu provide the family the legal and financial support to fight the case till the cause of justice is served. The Government of Tamil Nadu arranges for necessary counselling and psychosocial services for the family to deal with their deep personal loss and trauma. The case should be tried under the POCSO Act in addition to other relevant Acts and IPC provisions as Rajalakshmi was a minor. The Central and State Government must walk the talk with regards to their commitment to uphold the safety, dignity and integrity of women and girls, especially those from marginalized backgrounds such as Dalits, Adivasis and minorities by immediately setting up mechanisms/projects for the safety and security of women and girls through the Nirbhaya Fund, administered by Department of Economic Affairs, Ministry of Finance. The Central Government develops a nationwide scheme for witness protection outside the courtrooms. Lack of victim and witness protection acts as a significant barrier to obtain justice. It deters victims from cooperating with investigations and testifying in court, and makes it more likely they will turn “hostile” and retract earlier statements, contributing to unwarranted acquittals. Girls and women who report sexual violence are often even more vulnerable and face extreme pressure or direct threats from the accused.